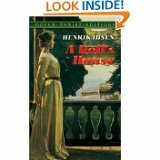 This is a free study guide to A Dolls House written by Henrik Ibsen. When this play was first performed in Copenhagen, Denmark in 1879, it provoked a storm. The theme of Dolls House, a woman's right to individual self-fulfillment, was considered highly subversive in an age when women were not allowed to conduct business without the authority of a father or husband, and were considered to be their property. Women were not allowed to vote, and divorce, though allowed, carried a heavy social stigma and was available only when both partners agreed. Novelguide is proud to offer this free book review with chapter summaries, analysis, and sample test questions. Remember to please click on the literary analysis category you wish to be displayed and that the Back and Next buttons can guide you through all the sections too. Weather you are studying for a test or writing a book report, you can choose to jump from section to section using the links below or the links at the left to help you understand the play.